Above Left the Mary Moorman photo; above Right is a magnified image from the grassy knoll area in the Moorman photo. Below Left is Mary Moorman, Below Middle is the Cancellare photo of the crowd seconds/moments after the assassination; Below Right is an enlargement of Mary Moorman and James Featherstone from the same Cancellare photo. 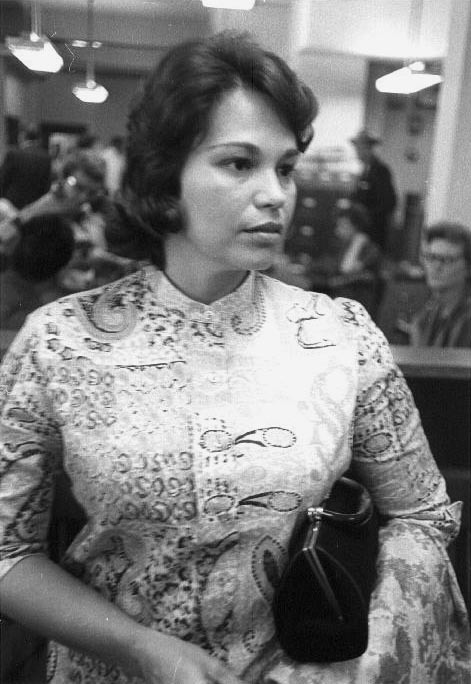 Mary Moorman was a 31 year old Dallas resident who went to see the JFK motorcade with her friend Jean Hill on November 22, 1963. Moorman snapped a Polaroid photograph of the JFK limousine as the assassins’ bullets hit JFK. Her photograph shows a wounded JFK as well as some of the grassy knoll area in the background. Moorman and Hill spoke of being harassed by a newspaperman named James Featherstone immediately after the assassination. 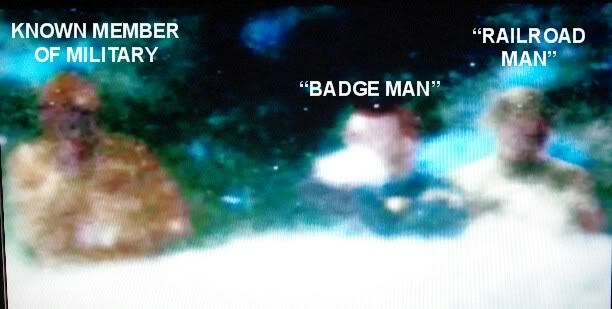 The FBI took Moorman’s Polaroids of the JFK motorcade and returned them several weeks later ‘mutilated,’ including a thumbprint which may have been strategically placed to cover-up the engaged red brake-lights of the JFK limo during the shots. In the face of this pressure, Mary Moorman decided to go along with the likes of Arlen Specter and the Warren Commission for her own safety, and has said very little over the years. She was excused from testifying to the Warren Commission for an ankle injury of all things. Gordon Arnold was the military man. He was not an actual conspirator in the assassination despite being caught in the crossfire. He spoke of diving for cover before being accosted by 2 cops after the shooting was over. One of the cops kicked Arnold and took his camera film, which corroborates Roscoe White’s account of leaping over the fence and kicking a military man before taking his film and running towards the railroad parking lot. 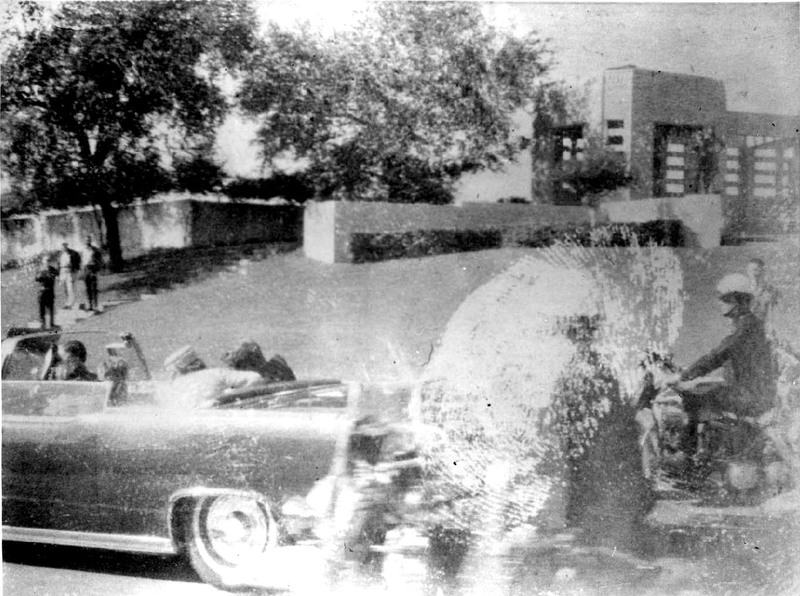 Mr. Arnold’s presence on the Grassy Knoll in uniform that day was confirmed by motorcade passenger Ralph Yarborough who noted Mr. Arnold’s military inspired duck and cover technique as bullets flew over his position. Polaroid photos like Ms. Moorman’s are/were harder to forge and alter than other films taken that day because of their instantaneous development. It is for this reason that the Moorman photo serves as a Rosetta Stone which has allowed researchers to determine whether the Zapruder, Nix and Muchmore films depict altered frames. Moorman’s photograph contradicts the Zapruder Film and shows that we have been seeing altered copies of that film. Mary Moorman’s photographic field of view shows her to be in one place while the Zapruder film has her in another place several feet away. She would literally have to be in 2 places at the same time for this to be! 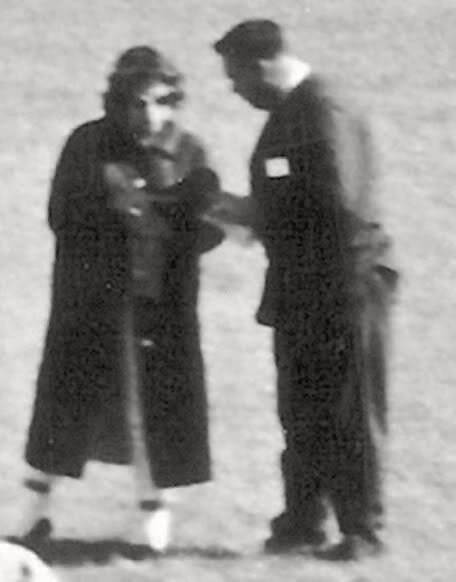 Astute researchers have also pointed out the fact that the Zapruder Film shows Ms. Moorman wearing white shoes while other films of the day’s events show her in dark shoes! 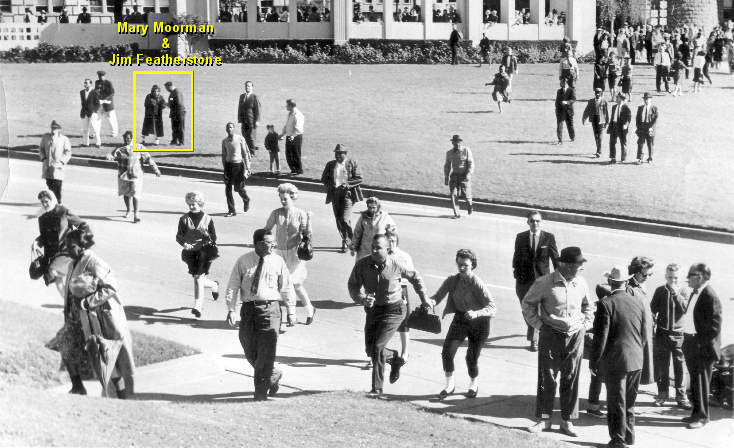 Additionally, the Zapruder Film shows Mary Moorman on the grass of the plaza, while she recalled stepping out into the street, itself. A man in the back of a pick-up truck in the stopped traffic on the opposite side of the road from JFK’s limo has also been edited out of copies of Zapruder Film, as well. Finally, further contradicting the authenticity of the Zapruder Film are the accounts of 59 separate witnesses who recalled that the limo stopped or came to a near stop (so that the shooters could finish off JFK). These facts establish that the Zapruder Film cannot be used to accurately time or assess the assassination since it was clearly altered. Orville Nix was an air-conditioning engineer who shot a film of JFK’s motorcade with his camera which actually shows one of the shooters(Charles Harrelson) firing a round at JFK from behind the Picket Fence/Grassy Knoll area! He turned in his film to the FBI after the assassination only to have it returned to him altered and missing a few frames(the frames which clearly show the shooter and the rifle smoke had to be altered). Eventually Mr. Nix sold the film to United Press International, after turning down prior offers from Life Magazine and CBS, who promptly hid the fully incriminating footage away from the public for decades! This is video of Arlen Specter describing his own implausible Magic/Single Bullet theory in the JFK Assassination after some practicing to get the story straight. Author Gaeton Fonzi was a writer for Philadelphia Magazine in the late 1960’s. One night the author was in the presence of Specter, then an ambitious Philadelphia District Attorney. Specter’s nervous stuttering and stammering when first asked about the specifics of his theory convinced Fonzi that there was a conspiracy in the JFK assassination. JFK was assassinated on November 22, 1963. The Zapruder film was not available to the American public until the mid 1970’s. Until then they had to take the word of people like Dan Rather as to what happened that day. Rather was one of a few people who had a viewing of the Zapruder Film before it was bought and locked away from the American public by Life Magazine. Once Americans were finally allowed to see the Zapruder footage of JFK’s assassination, Rather would be proven a liar for his earlier comments. The Zapruder Film was finally aired for American TV viewers in 1975 on a late night talk show thanks to the efforts of unwitting JFK sleuth…..Geraldo Rivera? The public airing of this footage killed the Warren Commission’s earlier whitewash efforts and necessitated the House Select Committee on Assassinations whitewash of the late 1970’s. Some have speculated that Abraham Zapruder was tipped off that something big was going to happen that day in Dallas and that he should be there to record the events for the sake of posterity. Other photos and film from the JFK assassination show that Zapruder could not have been more than 20-50 feet from the shooters, himself and was literally in their midst! It would have been impossible for him not to have seen any of the shooters or smelled the gunpowder from their weapons behind the adjacent picket fence/grassy knoll from his vantage point before, during or after the shooting. Nowadays, many researchers believe that even the Zapruder Film, once thought to have been the Rosetta Stone of the JFK assassination, has been altered from its original form. They assert that the film was tampered with to obscure the true timing of the event, JFK’s true headwound and flying brain debris(from a baseball sized exit wound on the back right portion of his head), and the near or complete stoppage of the presidential limo so that the shooters could finish off JFK. Witness Mary Moorman was actually in two separate places at once (which were several feet apart) when researchers tried to re-create her coordinates using her Polaroid photo and the Zapruder Film for comparison, further implying that one of the films has, indeed, been altered. Additionally, 59 separate witnesses including several Dallas police officers, reported a stoppage or near stoppage of the Presidential limo, which the Zapruder Film does not show! Still others have speculated that the Zapruder film was further altered to edit out the presence of a gunman(Johnny Roselli) and a puff of smoke coming from that gunman’s weapon from the storm drain on Elm Street near the grassy knoll.